Breyers recently launched Breyers Delights better-for-you ice cream line are now available in a smaller single-serve size with the debut of new Breyers Delights Minis. The new line comes on 4-oz cups featuring 70 to 80 calories and five grams of protein each. - Vanilla Cupcake - Low-fat vanilla ice cream made with cupcake batter and sprinkles. - Creamy Chocolate - Low-fat chocolate ice cream made with cocoa. 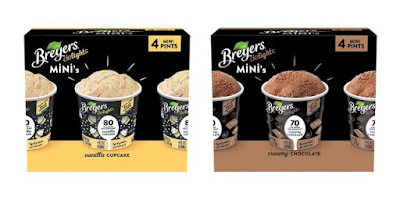 Breyers Delights Minis can be found in a 4-count pack with a suggested price ranging form $4.49 to $5.79.